Unicorn Store kind of has a Willy Wonka/Stephen King’s Needful Things vibe about it, at least from the trailer. It also stars Joan Cusack, Bradley Whitford, Karan Soni, Mamoudou Athie, Mary Holland, and Hamish Linklater. 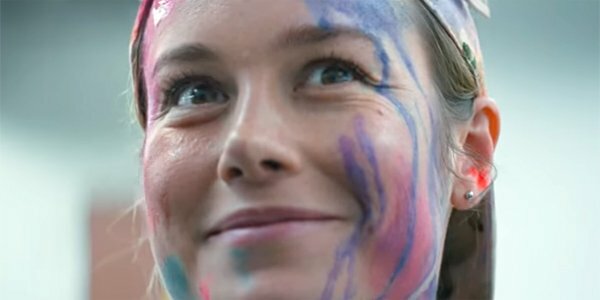 Unicorn Store marks Brie Larson’s feature film directorial debut. The comedy actually filmed in late 2016, before Captain Marvel, and screened at the Toronto International Film Festival in September 2017. It’s probably getting a prominent release now on Netflix because of that soon-to-be-billion-dollar movie starring both Brie Larson and Samuel L. Jackson. Brie Larson shot to worldwide fame as Captain Marvel, who is about to lead the MCU, but she got the role hot off her Best Actress Oscar for Room. And some of us have loved her since she played Toni Collette’s troubled teen in the Showtime series United States of Tara. This Unicorn Store role as whimsical, immature, lost soul Kit seems like a great contrast to Larson’s more serious strength as Carol Danvers in the hit Marvel movie. It’ll be refreshing to see her in a comedy in the middle of her back-to-back MCU movies. Of course, fans are already having fun cracking jokes about how this movie looks like Captain Marvel on drugs, and Thanos must’ve really messed with reality to put Carol Danvers and Nick Fury in this unicorn movie. There are also plenty of Goose jokes, wondering where the Flerken cat might be in this movie. ‘Cause it’s not a true teammup without the real hero. Unicorn Store, written by Samantha McIntyre, currently has a 68% fresh rating on Rotten Tomatoes, but that’s just from 19 reviews. Fans can judge the movie for themselves when it streams April 5. Here are more movies headed to Netflix in April, and don’t forget all of the incredible movies headed to theaters in April, like another one starring Brie Larson called Avengers: Endgame.